Apartment - holiday apartment Edelweiss is south and peaceful, ideal for 4-6 people and equipped with natural wood furniture. Spacious living is guaranteed through the cosy living room with satellite TV, W-LAN internet, the completely equipped kitchenette with oven and dishwasher, safe, radio-CD-player, cushion furniture (pull out double bed), 2 separate bedrooms, 2 bathrooms w/double vanity, hair dryer and 2 WC. To relax, there is a balcony facing the south with balcony furniture and a view of the large garden. Relaxation is promised from the wellness area with sauna, infrared heat cabin and steam bath, which our guests can use. Once you have really enjoyed your day, you can have a healthy sleep in our cosy rooms! Get comfortable, the Edelweiss apartment offers a lot of room to feel comfortable! We offer a bread service every morning. During the winter, the heated ski cellar with a shoe dryer is available. In the middle of holiday paradise! 45 m2 to 68 m2 apartments distinguished with 4 Edelweiss, peaceful, sunny and central location w/stunning view. 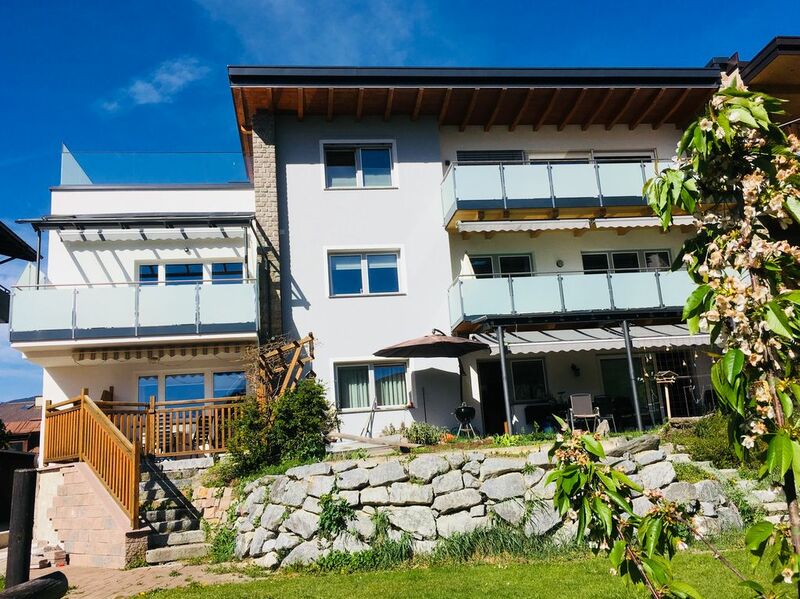 The rooms face the south, w/large balcony/terrace, wellness area with sauna, steam bath, infrared sauna (the wellness area is in a separate building a 3 minute walk from the house and for fees), playground, large garden. Grill house, table tennis, parking space. Our ski and hiking region Serfaus-Fiss-Ladis, Nauders, Ischgl, Samnaun, Fendels and the holiday region of Tiroler Oberland / Nature Park Kauner Grat offer relaxation and activity. The closest cable car and the idyllic lake are only 250 m from the house. We offer the summer card free of charge so that our guests have free entrance to 2 pools, the Rieder lake, the indoor pool, fitness center, bowling alley, tennis courts, children's program, plus you can take all public buses in the region free of charge! Super hiking pass-wellness-mountain adventure: Free from May to November: pool, lake, indoor pool, tennis, Nordic walking, climbing, Boccie, fun park, squash, archery, guided hiking and cycling tours, children's program, kiting, Bibland with Bibi express train, castle evening, visit to farm, torch hikes, etc. Tirol - all inclusive? Wellness can be found in the spacious wellness area w/sauna, steam bath, infrared heating cabins, solarium, Kneipp system, massage showers and cosy relaxation room (for fees). Massages are offered as well. The Kaunergrat Nature Park will excite you with a variety of colorful flowers and rare alpine animals. Glacier skiing with guaranteed snow already in the fall until far into spring. Ski fun - mountain spring - fall hiking weeks: our guest house and the village of Ried are in the middle of the skiing and hiking paradise of Serfaus-Fiss-Ladis-Tiroler Oberland-Fendels- Nauders- Kaunertaler Glacier Ischgl-Samnaun. Over 550 km of slopes bring boarders, carvers, fun athletes and beginners into their element. In the Kaunertal indoor pool and the fitness center, our guests have free access! For a wonderful skiing experience, the total snow guarantee on the Kaunertal Glacier is already guaranteed starting in October. A lot of toboggan runs, the large ice skating area by the lake, countless cross country trails, organized ski safaris, tandem flights provide for fun far from the slopes. A world for children and youths: directly in the village of Ried - fun and adventure for children and teenies! Children's program in the summer mostly free: 4 elements day, archery, creative day, gold search, knight castle evening, children's disco, build a boat, lantern hiking, children's show, stream expedition, etc. for youths - adventure camp: Beach volleyball, dropping, beach party, cinema evening, dart tournament, bowling, MTV Night Show, Nordic walking, water games, archery , fun park. For low fees: rafting cannoning, horse riding, tree rope obstacle course, children's water world, tandem paragliding. A sports-wellness program is offered: Motto 'elementary wellness in the harmony of nature' In the nearby Kaunergrat nature park - nature park tours with different activities - experience the best side of Tirol! The Fisser Flitzer, the summer toboggan run, the large swing and the Fisser Flieger, Murmeliwasser in Serfaus provides for fun in the middle of nature. Fun and action are guaranteed. Lake with water slide only 250 m away. Bedsheets, towels and hair dryer belong to the equipment of the holiday apartment. The WC is separated from the bathroom. The usage of the wellness area is for a fee. The wellness area is in a separate building near the apartment. Massages are offered as well. There is a cosy smoking corner in the house for the guests. Board games and books are also available. The apartment is particularly ideal for those with allergies, because the grounds and beds were created for people with allergies. WLAN internet access is in the apartment, thus, you can also see your emails during your holiday or use the internet! In the garden, there is a large wood house with grill station. Thanks to the central location of our house, you can design your holiday completely without a car! If you arrive by train, there is a good bus connection. The parking lot is directly in front of the house. There is a satellite TV available in the living room and in one of the bedrooms. You get a 5% discount on rentals by our sports consultant in Ried. The apartment faces the south and is light and sunny. Natural wood furniture guarantees for a comfortable atmosphere. The entire apartment has parquet floors and guarantees absolute cleanliness. The apartment can also be booked with a daily breakfast. The hit area hiking pass: The Summer Card GOAL - valid for 6 in 7 days - 12 mountain trains from the region (Serfaus - Fiss - Ladis, Nauders, Fendels, Venet, Kaunertal) - the fee for the Kaunetal Glacier Street, free entrance for all public traffic buses from the Nauders region - in the Kaundertal and in Serfaus-Fiss-Ladis. at a price of EUR 46.00 per person, children born before 1999 drive free. 8 burgs, castles and old fortresses invite you to tour. With the Gold Card, our guests enjoy a real added value. The wellness area is in a separate building a 3 minute walk from the house and for a fee. Golf: Closest golf course is approx. 40 km away - easy to reach. Mini golf in the city as well! Ski: Diverse ski area with guaranteed snow! With the Ski6-Pass, you can use 340 km of slopes with over 80 lifts nearby. Serfaus-Fiss-Ladis is only 5 km away, Nauders awaits with great slopes. Wonderful snow is guaranteed on the Kaunertal Glacier up to 3200 m high. The Ried-Fendels cable car is 250m from the house. Free ski buses quickly bring you directly to the ski region. Children up to 10 years of age receive the Bambini free pass in Fendels and on the glacier. You have free entrance to the indoor pool. During the winter, the wellness area is open daily! You can go skiing and snowboarding by us in October and until June. Several ski schools are present. For cross country skiers, there are diverse trails, guided snowshoe hikes in the natural park, tubing park for children, Ski-Doo course - simply everything for snow fans! The well-known ski regions like Ischgl-Samnaun and the Arlberg are nearby. The finest slopes await you!